Last weekend we took the boys across the bay to explore the USS Hornet, a decommissioned aircraft carrier in Alameda, CA. The scale of any of the large navy vessels docked there is simply amazing and to think that current Nimitz Class carriers are even bigger really boggles my mind. There are a few guided tours on the ship and 3 decks are self-guided areas that we were able to wander all over. Planes and helicopters were stored on the hangar deck as well as a couple on the flight deck while there were quite a few exhibits below on the second deck. We spent about 2.5 hours on the ship and after looking at the map of the ship when I got home, I want to go back because I feel like I haven’t even scratched the surface! After walking the flight deck for a bit we joined a group and took a tour of “the island” or the control tower on the deck of a carrier. I don’t think that they designed carriers with people over 6 feet tall in mind and navigating the hallways and stairs (that are more like ladders with handrails) while carrying my photo gear on my back was more challenging than I bargained for. 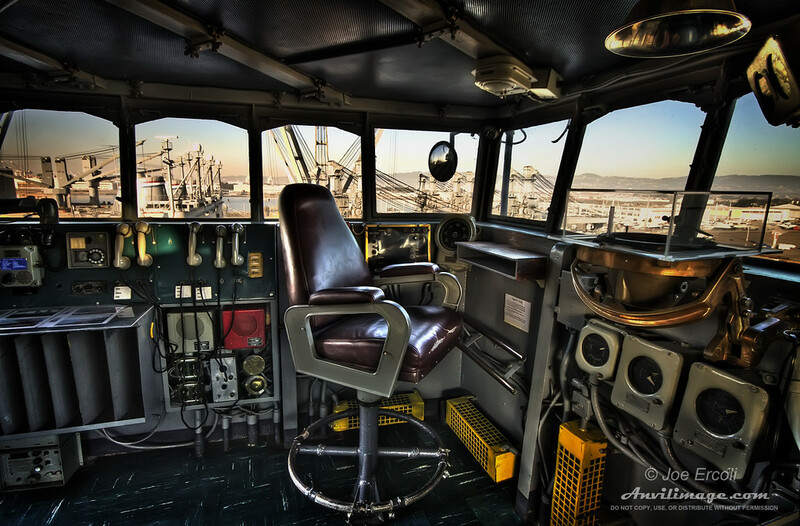 On the tour I didn’t exactly have time to setup my tripod for an HDR in this target rich environment, but I did manage to put together this handheld HDR of the captains chair overlooking Alameda. While exploring the ship I couldn’t help but think about my grandfather and his experiences on a cruiser during WWII including Pearl Harbor. You’ll always be my captain that I’ve looked to for guidance throughout my life. This ones for you Pop. HDR Info: 3 RAWs combined with Photomatix and spot corrected with Photoshop by layered exposure blending. Shot hand-held. This entry was posted on Thursday, January 22nd, 2009 at 2:10 am	and is filed under Blog, Photos. You can follow any responses to this entry through the RSS 2.0 feed. This is just great! The HDR tone mapping is perfect to me.